Today we have some very interesting football matches all over Europe. 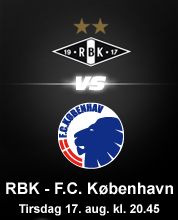 For us who live in Scandinavia the match between RBK vs FCK, or better mentioned Rosenborg vs FC København means a lot. It is not only about football and winning for qualifying to the group stage, but it is also about pride and the title of being "The Boss" of Scandinavia when it comes to football. Both coaches know each other very well, both tactically and in a personal lever. FCK's coach Ståle Solbakken respects the master of the Norwegian football, Nils Arne Eggen more than anyone else, even though this time he will definitely will want to beat Rosenborg and his mentor Eggen. It will be a war with 2 battles. Norwegians will have to "give it all" and prove that they are back in Champions League based mostly on young talented players and the Danish has to confirm what everybody believes so far ... that they are the best team in Scandinavia. For those who are interested in betting Oddsfather has the calculations ready and provided 2 days on before hand at the Betting Picks section on the main menu. Enjoy and spread the word about our site!